In addition to claiming a lien against a real property, contractors can also lien on construction funds regardless of tier. Therefore, a subcontractor has lien rights against any funds that are owed to the party that hired the subcontractor. A lien can be claimed to the extent money is owed to the party occupying the position in the chain above the subcontractor. N.C.G.S. 44A-18. The subcontractor's right to a lien becomes ripe as soon as labor or materials are first furnished on the job and relates back to the date the contractor or supplier first furnished labor, services, or materials on the project. The notice of a claim of lien upon funds must set forth all of the following information: (1) the name and address of the person claiming the lien upon funds; (2) a general description of the real property improved; (3) the name and address of the person with whom the lien claimant contracted to improve real property; (4) the name and address of each person against or through whom subrogation rights are claimed; (5) a general description of the contract and the person against whose interest the lien upon funds is claimed; and (6) the amount of the lien upon funds claimed by the lien claimant under the contract. N.C.G.S. 44A-19(a). The notice must also be served on the obligor (debtor) by personal delivery or in any manner authorized by Rule 4 of the North Carolina Rules of Civil Procedure. N.C.G.S. 44A-19(d). A copy of the notice of claim of lien upon funds shall be attached to any claim of lien on real property filed pursuant to G.S. 44A-20(d). Id. This article is provided for informational purposes only and should not be relied upon as a substitute for the advice of a legal professional. 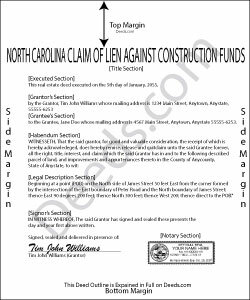 Please contact an attorney with questions about claiming a lien on funds, or any other issues related to liens in North Carolina.